Over the past few months at Capital Captions, we’ve been working a lot with opera and musical film subtitling. It’s been an absolute blast listening through some amazing musical sequences, working on caption timings and grammar, tapping our feet whilst we work… But fun aside, it’s been interesting to observe some of the fundamental differences in on-screen text for musical videos versus text for standard dialogue. Bearing this in mind, I thought it would be a great time to look into exactly what’s involved in musical closed captioning services. There are some rules that apply to musical closed caption formatting as compared to standard caption formatting. Below is a summary of typical formatting changes required for musical closed captions and subtitles. Lyric lines should always start with a capital letter and final full stops or commas should preferably be omitted. For musical films and operas, timing and rhythm is crucial. When closed captioning movies, timings can be tweaked to allow over-speaking, to avoid shot changes and to allow viewers sufficient time for reading. When working with music, however, priorities change. Closed captions for music should always be written for the best audio sync and verses should never be split simply to avoid a shot change. For standard film closed captioning, line splits are typically based around dividing subtitles in a grammatically logical way. Subtitles will generally follow rules around splitting an adverb from a verb, or an adjective from the noun it describes. For subtitling of operas and musicals, however, the rules change a little. Similarly to other movie and television genres, closed caption format will mostly depend on your distribution channel. Some of the most common musical closed captioning formats are below, along with some brief information on compatibility with major channels. 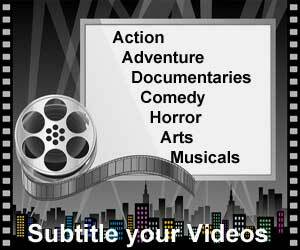 Subtitle burning (open captions) – all distribution channels with many formats available including: .mp4, .mov, .avi, .wmv and many more. So, as you can see, there are many subtle differences between on-screen text for musical videos versus standard dialogue. If you have your very own video masterpiece and require opera or musical closed captioning services, why not take a look at our list of services that can be tailored to your needs. If you are in a rush and are looking to price up your project today, don’t hesitate to request your closed captioning quote today. For anything else, please use the contact form below.